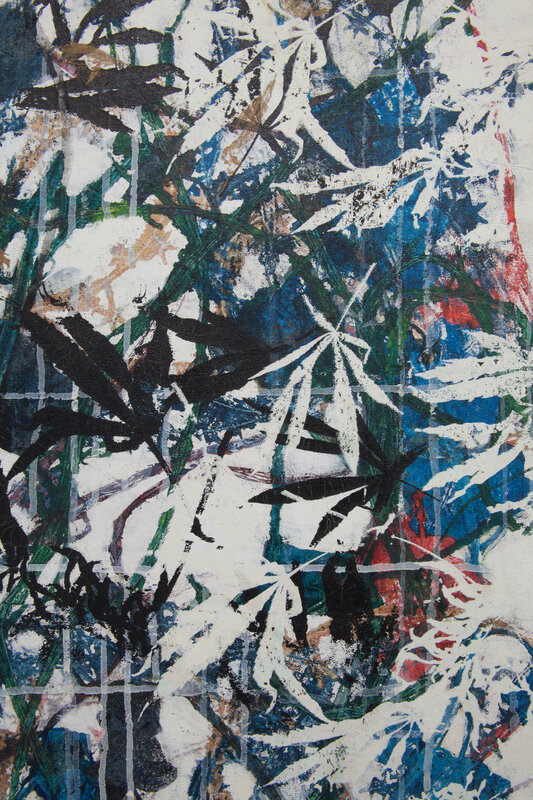 SITUATIONS is pleased to present Do I Still Yearn for My Virginity?, a solo exhibition by Chrysanne Stathacos, comprised of pivotal printed paintings of ivy and marijuana leaves from the early 1990’s. The title Do I Still Yearn for My Virginity? * refers to one of the artist’s favorite fragments from the archaic Greek poet Sappho. Stathacos recited excerpts from Sappho’s poetry during her recent performance-installation, Pythia's Rose Mandala at AA Bronson’s Garten der Lüste, KW Institute for Contemporary Art, Berlin and Pythia at The Breeder, Athens. The Pythia references the tripod structures used in ancient Delphi by the 'virgin' female oracles who inhaled the vapors of hallucinatory plants. Reflecting on her past, Stathacos presents the paintings as 'virgins’ to the public for the first time at Situations. While imagining The Eleusinian Mysteries, she created these radical works with the intention to evoke a shamanistic reading. Made in the 1980-90’s as a counterpoint to the Neo Geo and The Pictures Generation commentaries on consumerism and mass media, her investigation explored the spiritual properties inherent in visionary and healing plants. Additionally, the AIDS crisis had a profound effect on her work, resulting in the use of direct impressions from nature. Just as one would take a handprint or make a death mask, Stathacos used leaves, roses, hair, and body imprints to create permanent marks, inspired by The Shroud of Turin and Yves Klein/s work. Stathacos' use of mirroring and patterning of direct printing from the plants manifests a sense of immediacy. She paints back into the canvas, creating an illumination by her use of drips and veils of paint. 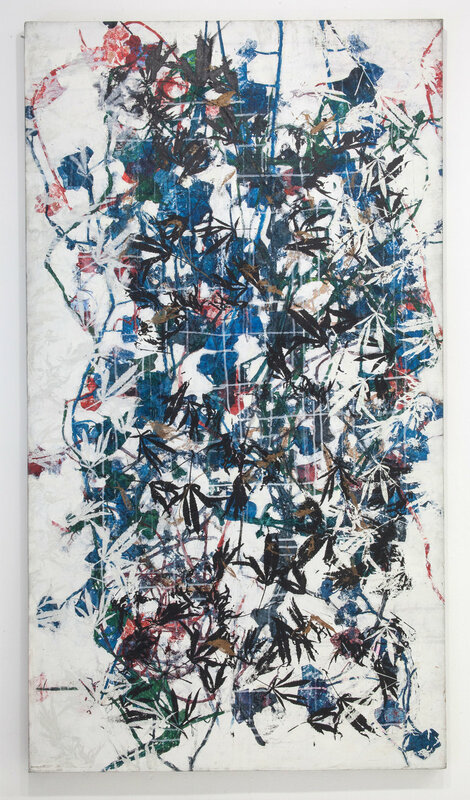 The final results are paintings that flip directions in the mind, with detailed alchemical gestures that conjure the plant’s inherent healing properties. Situations is also pleased to reprint Chrysanne Stathacos and Anne De Cybelle, AA Bronson’s preface in her artist book, And So Beautiful (1995, Lombard Freid Fine Arts, NYC). AA Bronson references Stathacos’ self-created alter ego Anne de Cybelle and reveals her as the Psychic d’Elle Arte. Stathacos continues to embrace her Anne de Cybelle, the Psychic d’Elle Arte, and Pythia personages. CHRYSANNE STATHACOS (b. 1951, Toronto, Canada and Athens, Greece) is a multidisciplinary artist. Her work encompasses printmaking, textiles, painting, installation, and conceptual art. Stathacos is heavily involved with and influenced by feminism, Greek Mythology, eastern spirituality, and Tibetan Buddhism, all of which inform her current artistic practice. Stathacos has exhibited in museums and galleries internationally over the past 30 years, including Oracle Drawings, documenta 14, Athens; The Breeder, Athens; KW Institute for Contemporary Art, Berlin; Witte de With Centre for Contemporary Art, Rotterdam; The Power Plant, Toronto; Thread Waxing Space, New York; Participant Inc, New York, Andrea Rosen Gallery, New York; Fiendish Plots, Lincoln, Nebraska, and The Wish Machine exhibited at Grand Central Station under the auspices of Creative Time Inc. She has received grants from the Art Matters Foundation, the Japan Foundation, the Canada Council for the Arts, and the Adolph &amp; Esther Gottlieb Foundation, among others. Stathacos has upcoming exhibitions at The Sculpture Park, Madhavendra Palace, Nahargarh Fort, Jaipur, India and at Cooper Cole, Toronto.